We cut small and large lawns. Offering a weekly or two weekly service. The lawn cuttings are collected and removed. Lawn edges are strimmed or cut subject to requirements. We always cut your lawn with a lawn mower that has sharp blades. Mowing regularly at the right height will promote grass growing side shoots (tillering) This is important as it will make your grass denser and sward thicker healthier. Mowing height and mowing frequency determine how healthy and attractive your lawn looks. It is best never to remove more than one-third of the grass blade. If you cut too hard the plant goes into shock and turns very pale, almost white. By regular mowing at the correct height the grass takes on a dwarf habit and a thick healthy sward develops. If the grass does get away from you for one reason or another it is best to raise the height of cut and bring it down step by step until, you reach a satisfactory height over a number of days or weeks. You will probably have to increase the mowing frequency during this process. Achieving a clean cut is important because bruised grass loses moisture from the plant and also leaves a ragged looking lawn. Have your mower serviced annually, they will sharpen the blades ready for the season ahead. 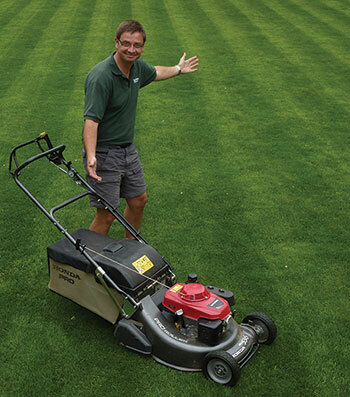 A lawn cut height of 25mm to 50mm or 1" to 2" is recommended. Remember cutting more than a third of the grass height off will weaken the grass. Ideally cut frequently when actively growing, this could be twice a week. Have your mower regularly checked and serviced by a professional. Sharp blades cut cleanly, blunt blades tear and bruise the grass. This will stress the plant and could allow disease in. Its is best to remove these from the lawn as they can increase the chances of lawn diseases developing and increase thatch. There is a tendency to always cut the lawn in the same direction. Where possible some variety in direction will help prevent the grass taking on lay patterns or tramlines from lawn mower wheels. Do not be tempted to fill up on your lawn a a spill will kill the grass.